Purchased and rehabbed in 1999, Art Produce was once a boarded up building that had housed the North Park Produce market. Art Produce is now a non-profit community cultural center that connects artists, cultural organizations, schools, urban farmers and businesses. We support cultural production, mentor community engagement by artists, and provide affordable cultural activities in a community setting. Our mission is to build community and foster civic engagement through arts, education and public culture. The Citizen Artist assumes responsibility to participate in the cultural life of the community, creating opportunities and interest in the civic process and public culture. If we don’t do it, who will? The Gallery is a unique artist run storefront exhibition space and public art experience in North Park, a diverse and historic urban community of San Diego. It is entirely visible from the sidewalk and was designed to accommodate sculptural installations, cross-disciplinary works, digital media, and performance events. The space allows for unconventional presentation opportunities for artists and unexpected art encounters for viewers. Intended to enliven the experience of the pedestrian it is an experiment in public art that is accessible to everyone in the community - an attempt to render visibility and transparency into the art process itself. Visit the Gallery page. The Garden is a public art /performance space/cultural space focused on aesthetic, educational and sustainable/green practices. It was transformed from an asphalt parking lot into an edible garden and orchard and now hosts film screenings, performances, art installations and community events. It incorporates an outdoor classroom and workspace into an urban garden that includes a rainwater catchment system and a PV solar energy system. The Garden expands our cultural community engagement programming to the outdoors and was awarded funding as a Sustainable Design Pilot Project by the North Park Redevelopment Agency and is an example of business and public culture creating a synergistic combination for the health and vitality of the neighborhood. Visit the Garden page. Stone Paper Scissors, owned by Lynn Susholtz, has been creating art projects for public agencies, schools, business associations and communities since 1994. Previous projects have included the planning of public spaces, developing public arts initiatives for neighborhoods, collaborating with design teams, integrating art into capital projects, and fabricating sculptural works. Commissions for public and private spaces, range from urban storefront improvements to playscapes for children to the design of community gardens. Learn more at StonePaperScissors.org. Artist Residencies, Community Art Classes, Internships, Learning Lab, Partnerships/Collaborations, and Community + Culture events. Orchids & Onions is an educational and fundraising program of the San Diego Architectural Foundation and is the only interactive, community-based program geared towards raising awareness and encouraging practical discourse in response to San Diego's built environment. To see a timeline and before and after photos, visit our History page. Art Produce Building was awarded the 2009 ORCHID for Public Art. 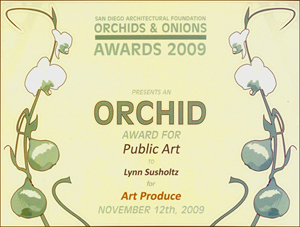 Art Produce Building/Garden won a 2011 ORCHID for Sustainable Design.